This product requires the base game Just Cause 2. 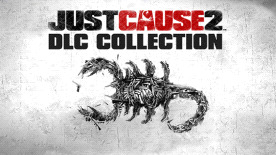 The Just Cause 2 DLC Collection includes all of the additional weapons and vehicles needed to create chaos and destruction on an even bigger scale! The ultimate in amphibious transport, the Agency Hovercraft is the most flexible form of transport in the game. Steered by a thrust-based engine for smooth and agile movement, the vehicle is as comfortable on land as off. Equipped with a turret-mounted grenade launcher, you’re guaranteed to blow your opposition out of the water. With the Black Market Aerial Pack you get these cool items: F-33 DragonFly Jet Fighter, Dual Parachute Thrusters and Multi-lock Missile Launcher. With the Black Market 'Boom' Pack you get these cool items: Quad Rocket Launcher, Cluster Bomb Launcher and Air Propulsion Gun. More powerful than the standard assault rifle, this lightweight and lethal automatic rifle features increased accuracy in close combat and a higher magnification scope. The usefulness of an oversized monster truck when destabilizing small countries is clearly evident. Grab this Monster Truck DLC for use in Just Cause 2! Customised by the Agency and adapted for Rico’s shooting style, this deadly accurate and powerful pistol packs a punch with precision, power and flair.